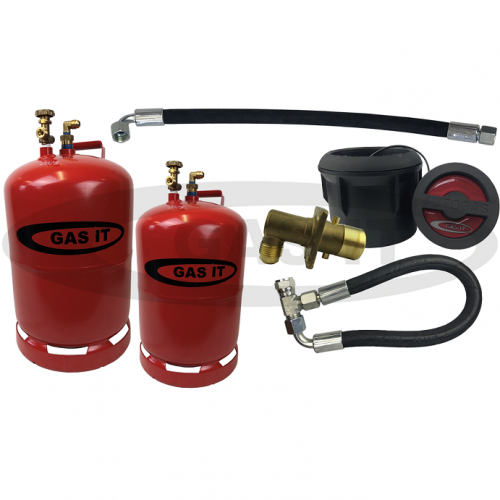 GAS IT self refillable gas bottle with black remote fill point and fill hose for use in any Motorhome, Caravan, Campervan, Farrier & Catering Vehicles and Road repair companies - GAS IT Leisure Gas Bottles, Gas Cylincers and Gas Tanks - Catering, Motorhome, Campervan, Caravan, Farrier and Road Repair Refillable Gas Solutions. FREE UPGRADE TO 6KG AND 11KG GAS IT PLUS BOTTLES WHEN YOU PURCHASE THIS STANDARD GAS IT 6KG & 11KG BOTTLE KIT. Please see GI-VB-004 for more details and technical information on the Plus bottles as the GAS IT Plus bottles have a removable shroud and also a gas level indicator that is lay flat. Please read the listing for the GAS IT Plus bottles to make sure it suits your needs before ordering. GAS IT Self Refillable gas bottle are easy to use, save you money and are super convenient to use and fill up, plus they come with a free LPG gas locker safety sticker. 4) No Lifting and carrying of exchange gas bottles. 6) No having to send back part filled exchange bottles, just incase you need more gas on the next trip. 5) Exterior mechanical gas level gauge shows Indication of gas level within the bottle. This GAS IT bottles come with a mechanical gas contents gauge to show you what gas is left in the bottle and an 80% automatic shut off fill system making the refilling process childsplay, also connecting a GAS IT bottle to your regulator is no harder than you using your normal exchange type gas bottle. This GAS IT brand of 11kg Refillable gas bottle is designed to be refilled with cheap Autogas at any Autogas/ LPG station in the UK and Europe. Autogas is normally sold several times cheaper than renting and exchange your normal brand of exchange gas bottles plus you have the luxury of being able to fill up when you want, and where you want. so you'll never run out of gas again. GAS IT bottles and valve system are manufactured in Europe and are fitted with an automatic 80% shut off fill system, meaning you simply attach the Autogas pump to your vehicle mounted LPG fillpoint, and when the gas bottle is 80% full, it stops filling. The 2 connections - inlet and outlet, on the GAS IT bottle are the standard refillable elbow with LPG connection fitting identical to our other GAS IT bottles and GAS IT tanks, plus Gaslow, Alugas, Prakto and many more, meaning partnering them with your existing refillable bottle is possible. This Twin GAS IT brand of 6kg & 11kg Refillable gas bottles are both fitted with a float level / content controlled and displayed on bottle flow valved outlet and comes with the standard refillable elbow with fitting identical to our other refillable bottle brands. These Refillable gas bottles can be partnered up with the identical Gaslow type so you are sure of absolute computability should you decide to have more than one bottle fitted. Height: 492mm height x 246mm diameter.